I was on my way from Kenya’s Jomo Kenyatta International Airport in Nairobi to a meeting and got stuck in one of the city’s endless car jams — that’s when my taxi driver began a conversation about the lack of rain. A veteran of countless conversations with his counterparts in London, which normally end up with a rant against the government of the day, I was wary. This one, however, was different: wide-ranging, comprising a discourse from him on the merits of drought-resistant maize seed and the challenges of accessing it. And it was interspersed with my own reminiscences of farm life as a boy on the other side of the continent in Ghana, and the challenges of smallholder farmers’ access to global markets. This exchange reminded me of one of Africa’s great realities: no matter where you are or what you do, every family is in some way connected to the land. Agriculture remains a vast and still largely untapped resource for the continent, awaiting the long overdue green revolution. Fortunately, there are increasingly reasons to be optimistic about agricultural development in Africa. According to the 2016 Africa Agriculture Status Report, Africa’s farms have registered the first signs of sustained agricultural productivity growth since 2005 and after decades of stagnation. International organisations are also prioritising agriculture. For instance, the African Development Bank’s annual meeting is to be held this week (May 22-26) in India under the banner “Transforming Agriculture for Wealth Creation in Africa”. Why is this theme significant? Africa harbours immense agricultural potential, which can help power its socioeconomic transformation. With some 200 million hectares, Sub-Saharan Africa boasts half of the world’s arable land that can be used for agricultural production. The sector also remains the backbone of Africa’s economy, accounting for 24 per cent of gross domestic product (GDP) across the region and employing just over 60 per cent of local labour forces. Agriculture’s role in the continent’s future economic development is only set to grow, with its food and beverage markets predicted to reach US$1 trillion by 2030. For the most part, however, this agricultural promise remains unfulfilled. The sector’s productivity lags behind other developing regions, which affects food security and imperils future economic growth. The continent’s farmlands and rangelands are increasingly degraded, resulting in lower crop yields. In addition, 95 per cent of agriculture in African countries is rain-fed, making it particularly vulnerable to changes in climate patterns considering low levels of irrigation. Infrastructural problems and a lack of appropriate financing further hamper the sector’s growth. If we are to ensure that agriculture can play its true role as a catalyst in achieving sustainable development in Africa, we must take decisive action. I believe that investing in scientific and technological innovation is essential. Scientific research can create the higher-yielding, resilient food crops needed to boost agricultural productivity, alleviate poverty and improve our citizens’ well-being. For example, before the introduction of drought-resistant maize in South Africa in 2002, average yields in South Africa were around 2.4 tonnes per hectare. According to agricultural economist Wandile Sihlobo, these increased to around 5.3 tonnes per hectare in 2013/2014, the highest average commercial yield on the African continent. These GM maize crops have also proven to be more tolerant against armyworm, an invasive pest causing havoc in Uganda and other African countries, compared with conventional crop varieties. I was also impressed to learn about the development of the orange-fleshed sweet potato (OFSP) on the continent which the World Food Prize called “the single most successful example of micronutrient and vitamin biofortification”. At a recent event held by the Planet Earth Institute, we heard from Robert Mwanga, a member of International Potato Center (CIP) team that developed this disease-resistant, drought-tolerant, high-yielding OFSP variety well suited to the diversity of soils and climates in Sub-Saharan Africa. What makes this innovation especially valuable is that the scientists have bred vitamin A and other crucial nutrients into these staple crops, which can combat deficiencies and reduce hidden hunger. Vitamin A deficiency affects more than 43 million children on the continent. Since 2009, the CIP has shared 56 new potato varieties with nine countries in the region including Ethiopia, Kenya, Mozambique and Uganda. But the role of S&T goes beyond new crop varieties. An increasing number of African countries have also found that investment in space science and technology can provide essential data for decision-making in agriculture. Nigeria’s first orbiting satellite, NigeriaSat-1, for instance, provides data and imagery to help monitor conditions that may affect the country’s farmers. The satellite has also been used to create the first detailed map of the country, allowing the government and policymakers to determine where farming takes place, and provide better support for its large rural communities. According to the African Development Bank, the low level of special financing is one of the major constraints in boosting the agricultural sector on the continent. Technology has a role here too, with tools that can help enhance access to finance for smallholder farmers, who make up 80 per cent of local agricultural workers. 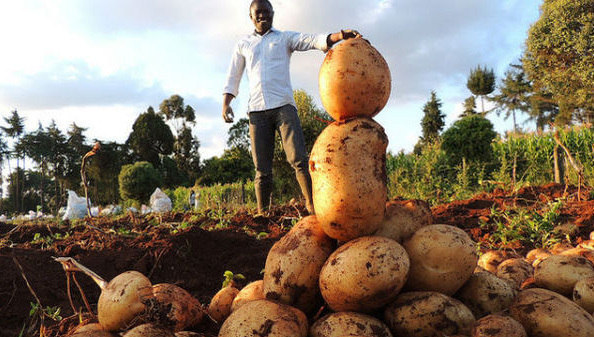 In Kenya, for example, the Syngenta Foundation for Sustainable Agriculture, UAP Insurance, and telecoms giant Safaricom have formed a partnership to create Kilimo Salama (‘Safe Agriculture’), an insurance product for Kenyan farmers. Using the MPESA mobile-based banking system, Kilimo Salama offers insurance policies to farmers who rely on very small fields. The idea is to protect them from significant losses incurred during drought or excessive rainfalls. Given that such programmes can truly enhance farmers’ productivity, the continent’s private sector companies should explore similarly impactful activities that can generate a competitive financial return. I hope to see new partnerships developing in which the private sector works with universities to take advantage of the new enabling environment that central bank governors and ministers of finance and agriculture are creating on the ground in Africa. This is the surest pathway to move from “striving to thriving” in agriculture, with science and innovation as its foundation. Paul Boateng is a former chief secretary to the UK Treasury and is chair of the Planet Earth Institute and the Nairobi-based Africa Enterprise Challenge Fund. He can be contacted at planetearth@planetearthinstitute.org.uk.